And just like that, a draft filled with franchise players was off to the races. With names like Michael Jordan, John Stockton, Charles Barkley and Akeem Olajuwon (at the time the entire world spelled his name Akeem but Olajuwon only began to correct people about how to properly spell his name later in his professional basketball career), the league was going to have some great superstars. But here is the funny thing about this historical draft: everyone in the world criticized the Portland Trail Blazers for selecting Sam Bowie ahead of Michael Jordan, but rarely do we hear about the fact that Olajuwon was the number one overall pick. By the way, before we proceed, let me try to give the Trail Blazers a pass for once. After looking at Hakeem’s college statistics, can you guess which center was drafted in 2007 after averaging a similar 15.7 points, 9.6 rebounds, 0.7 assists and 3.3 blocks per game on 61.6 percent field goal shooting? Greg Oden, that’s who. That’s why Portland has trouble pulling the plug on the Oden experiment (Oden also averaged less fouls per game during his brief stint at Ohio State than Olajuwon did during his collegiate career at Houston). Hakeem Olajuwon was a productive big man during his college career but more importantly the NBA was being dominated by the likes of Kareem Abdul-Jabbar, Moses Malone, Kevin McHale and Robert Parrish; consequently any franchise with title aspirations needed a star center to compete for an NBA championship. And in selecting the player that would eventually earn the nickname “Hakeem the Dream”, the Houston Rockets now had two star centers. Indeed, Houston had selected Ralph Sampson the previous year in the draft and now had a formidable twin towers to compete against the NBA’s elite teams. To put this in proper perspective, try to picture David Robinson and Tim Duncan playing together… at the same age. Terrifying. Unfortunately for Houston, the pairing would be unsuccessful given Sampson’s injury issues and yearly declining production. As his body broke down the Rockets traded him during the 1987-88 season (his fifth season with the team). He was a beast on offense, getting his points in a variety of ways, many of which were reminiscent of Kevin McHale. Indeed, Hakeem would post up defenders and go towards the middle of the lane for an unstoppable jump hook, and just when defenders were expecting the hook, he would drop step towards the baseline and power over centers for thunderous dunks. But there was still far more to it in his arsenal. The former Houston Cougar liked to keep defenders guessing, hence he would fake the baseline drop step and then just elevate for the fall away jump shot as his man unsuccessfully tried to contest his shot. After torturing you with those series of moves, Olajuwon would set up drives with fake drop steps and pump fakes and then leave you in the tracks wondering what had just happened as he went by his defender for an easy deuce. But when the Dream really felt like toying with his defenders, he would fake the right hook, drop step baseline and dribble towards the basket as if he was going to do a reverse a lay up; except he would make it to the other side of the rim, do a pump fake to get his man off his feet and then dunk the ball, or actually do a reverse lay up from the side of the lane he had just vacated. Darryl Dawkins once said he would get nightmares before playing Kareem Abdul-Jabbar because he knew the skyhook was coming and could not stop it; but Olajuwon probably gave his opponents just as many headaches and night terrors with his polished offensive repertoire. Out of all the active players in the NBA today, Pau Gasol’s post game seems to bring back occasional memories of Hakeem Olajuwon. Granted, Hakeem was stronger than Pau and thus had an easier time getting post position and backing his opponent down every now and then. As great as Dream was on offense, his defense was just as impressive. He cleaned out the boards, kept players out of the paint, blocked shots at the rim and also changed countless ones. 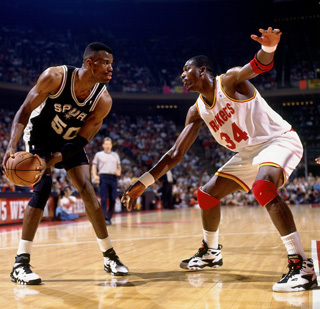 In that sense, Olajuwon was the prototypical center. And yet, there was nothing conventional about him. Hakeem could switch in pick and roll defense and guard some perimeter players away from the basket without getting beat (think back to Hakeem preserving a Game 6 win in the 1994 Finals on a partial block on a John Starks 3-pooint attempt). 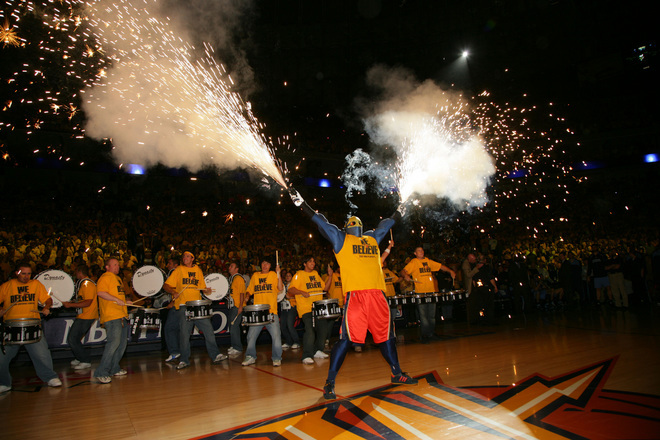 Further compounding issues for opponents, the Rockets star anticipated plays exceptionally well and thus often disrupted opposing offenses by getting his hands on the ball on defense to force steals. 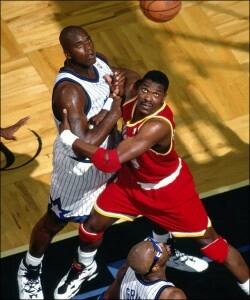 Essentially, Hakeem Olajuwon was a taller version of Ben Wallace (in his prime) on Red Bull and steroids. He just did it all defensively on the basketball court. Other than possibly Bill Russell and Wilt Chamberlain, it would be highly difficult to pick a player not named Hakeem Olajuwon to anchor one’s defense. His combination of speed, quickness, strength, length, awareness and heart make him one of the best defensive forces the game of basketball has ever seen. And should I remind you all, he was a two-way player. For all of Hakeem Olajuwon’s gifts, his legacy is tied to two players for different reasons: Michael Jordan and David Robinson. Fair or not, the Houston Rockets won two NBA titles while Michael Jordan was busy playing baseball. As a result, a lot of people feel that MJ essentially gave the league the proverbial pass for two years, until he came back and claimed what was rightfully his. Hence, certain people believe that had Michael not retired after the 1993 season, Olajuwon might be ringless. David Robinson on the other hand got his lunch money, laundry tokens and arcade change taken from him by the Dream. Prior to the San Antonio Spurs facing off against the Houston Rockets in the Western Conference Finals, Robinson was presented with the MVP trophy. What went on afterwards was nothing short of a complete annihilation of a player that many thought was perhaps the best center in the league. But more impressively, Olajuwon averaged those numbers in back to back playoff seasons while going up against the likes of Patrick Ewing, David Robinson and Shaquille O’Neal. With the way the game is presented today around the globe, if the Dream played in this current era, people would be clamoring to have him probably somewhere in the top five players of all time discussion. But all things being equal, his spot is somewhere in the top 15 seems just about right. The Mount Rushmore of NBA centers as far as I’m concerned should feature: Bill Russell, Wilt Chamberlain, Kareem Abdul-Jabbar and Hakeem Olajuwon. By the time Hakeem’s career was over, he had gone through a long list of centers who never truly figured out how to slow him down. It’s as if they always played against him in slow motion while he played at normal speed and feasted on his opponents. To those who watched him play and also those who competed against him, the confusion he brought with his arsenal of offensive and defensive weapons made it look like one thing, and one thing only. As great as the names on your mt rushmore of centers, I find it hard to omit Shaq. He was one of the most dominant centers to ever play the game and has more rings than both olajuwon and wilt. Hakeem was one hell of a player in the day.